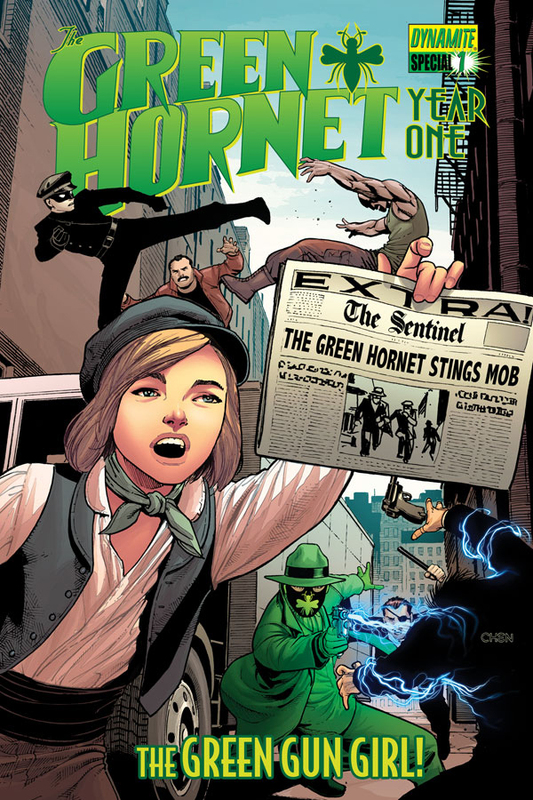 The Fellowship was fortunate enough to obtain a copy of GREEN HORNET YEAR ONE: SPECIAL #1 from Dynamite Entertainment. The story is by Nate Crosby, art by Edu Menna, colors by Marcelo Pinto, and letters by Marshall Dillon. The art for the old style comic sequences are by Evan Shaner. Ruby is a little girl who sells newspapers on the streets. Her mom is dead and her father is an alcoholic. She keeps up with the stories about the Green Hornet and knows that while he is portrayed as villain by the Daily Sentinel, there’s more to him. She constantly daydreams about helping out Green Hornet and Kato at a crucial time in one of their adventures. But when the real opportunity presents itself, is she up to the task? And if she does, will she regret that decision? This is a great little done in one story here by Nate Crosby. Special hand to Evan Shaner for capturing the spirit of the golden age of comics during Ruby’s daydream sequences. It serves as a stark contrast to her reality that Edu Menna captures really well. These are the types of books I pick up on a whim when I want to try something I wasn’t reading before. This is definitely worth checking out. GREEN HORNET YEAR ONE: SPECIAL #1 is in stores now and available at www.dynamite.com.